When we first bought our house, we had grand visions of turning the mudroom into this eventually. Of course, it would be on a much smaller scale. We drew up some plans and got a bid: $1800!! It didn't take us long to decide that $1800 could be used much better than on a mudroom. That would not be in the budget for a looooong time! The mudroom on move-in day. Gotta love the stars. We painted the mudroom when we painted the kitchen last January and had the wood floor extended into it. We had some random shelves we put in there, but as you can see, it just became a room of clutter. Besides that cute little girl! We knew there could be a cheaper way to make it a more functional space. On a trip to IKEA (months ago!--projects take so long! ), we came away with a bench and some shelves we weren't planning on buying. Don't you love/hate IKEA for that? Of course, the width of our room had to be 3" too short to fit our shelf and bench, so Brandon (being the awesome handyman he is) customized each piece to make it fit just perfectly. We wish the Billy shelf would have been a few inches taller to fill the whole vertical space, but it is what it is. We added some coat hangers and I really love seeing Blake and Evelyn's little coats and backpacks hanging up. I also really love that Blake can hang his coat up all by himself. Gotta train them young, right? The best part is we did it all for $212!! Now if only I can convince Brandon that we should go to Hawaii with the extra $1600 we saved. Ha! So happy to have a more organized mudroom. 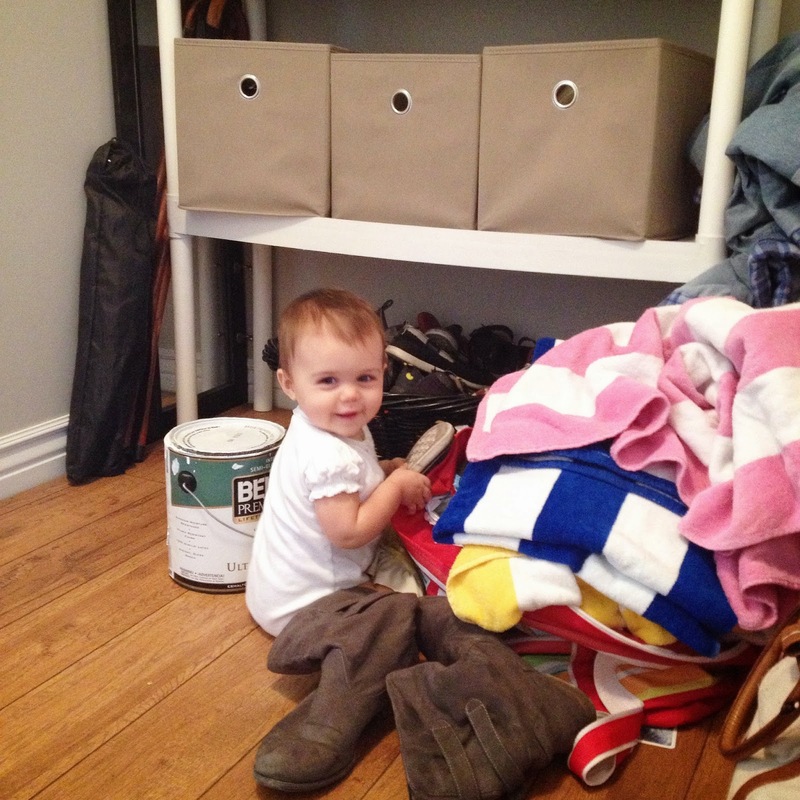 ^this girl loves shoes already and is constantly trying to put them on! That turned out really nice, and seems quite convenient! We just redid our mudroom! (And by we, I mean mostly Chad.) It is so nice to have done. I'll try and send you a picture on instagram.